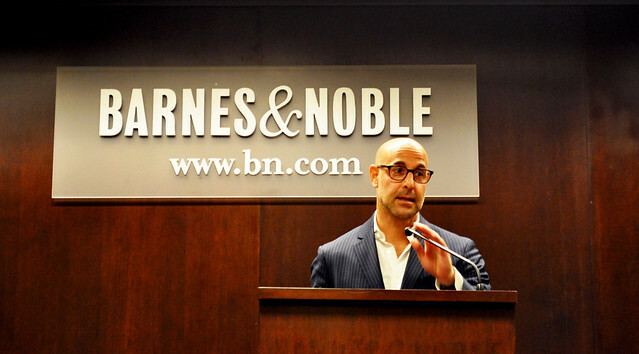 I had the pleasure of attending a book signing over at the Barnes & Noble located at 82nd and Broadway for the awesome Stanley Tucci and his new cookbook. Even around 6:15 PM, the event space was getting filled up quickly. Mr. Tucci arrived a little bit after 7 PM with a humorous yet stylish entrance -- can't miss his chance for a photo op! 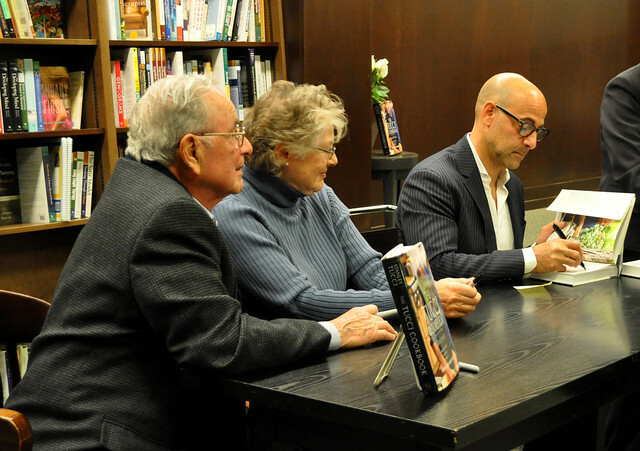 He began with a brief introduction behind the cookbook, its history, its influences, and its roots in his family's cooking as well as in collaborating author, Chef Gianni Scappin, and his family. While the audience was quite fascinated with this story, he still added some humor to it all and apologized to the audience. "Ahhh, I am being SO boring right now -- I am so sorry." Everyone laughed. 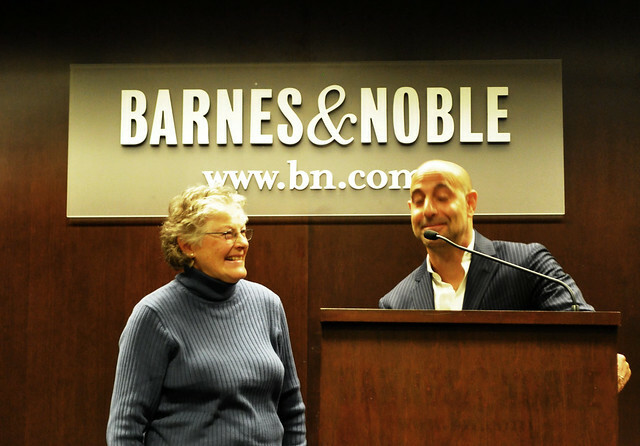 Mr. Tucci noted that his mother, Joan Tucci, is a great cook and learned from his grandmother who learned from her mother and so forth. Same goes for his father, Stan Tucci. His film, Big Night, celebrated "whom and where he came from, offerng not only a positive view of Italians (i.e., no gangsters) but a more humanistic view, one that would show the complexity of this extraordinary people." 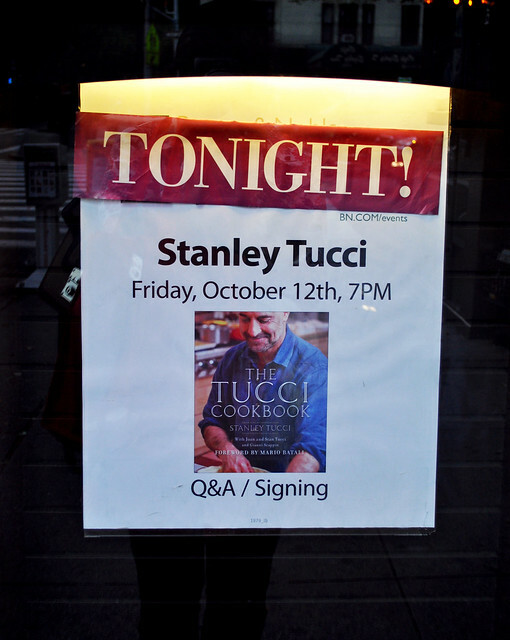 A year later, this inevitably lead to his family co-writing a cookbook with Chef Scappin (with whom Mr. Tucci studied with to familiarize himself with his character's role in Big Night) which would become the first iteration of The Tucci Cookbook (then entitled Cucina & Famiglia, "a shorter, less glossy version." Since then, the book had gone out of print, and due to a surprising demand for this book, Mr. Tucci's wife, Felicity Blunt, brought a second life to this cookbook, which became the very book we were all here to discuss and celebrated here tonight. 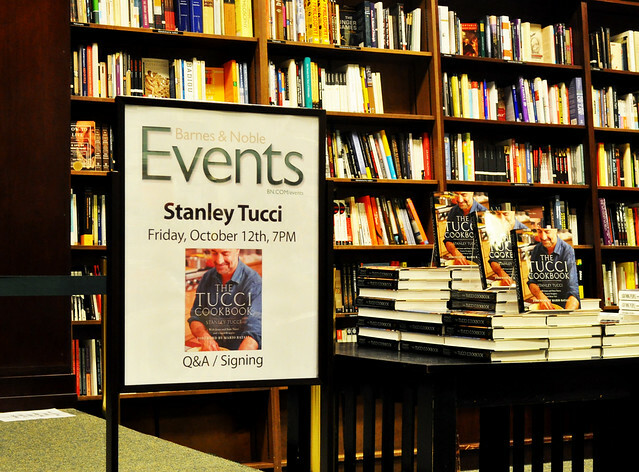 Which recipes would you yourself make on a weekly basis from The Tucci Cookbook?Mr. Tucci: "A lot of it is great for daily meals. But if I had to pick, the pastas." Favorite restaurants in New York City? Mr. Tucci: "Marea... right, honey? (looks over to his wife, who shakes her head) Ohhh, Aldea! Basically any restaurant that ends in 'A' is good! But seriously, Scalinatella is great. And Joe's Shanghai -- you know, the place with the dumplings filled with soup, that I always somehow spill all over myself because they don't have lobster bibs? Oh, oops, and of course, Mario Batali's restaurants, and not because he wrote the Foreward or paid us to say that! He's a great friend of ours!" Favorite wine recommendations?Mr. Tucci: "All of them." Favorite brand of pasta? Extra virgin olive oil? Mrs. Tucci: "Barilla or De Cecco -- they offer a pretty good variety and are easily accessible. As for extra virgin olive oil, I've been using Filippo Berio for years." Mr. Tucci: "Yeah, and I think Barilla comes from Iowa. I know it sounds strange, but it works! Hmmm, for olive oil, we've been buying Frantoia by the case. But for the most part, you can't go wrong with extra virgin olive oil -- just don't buy 'lite' olive oil. I don't understand it -- it's stupid!" Mrs. Tucci: "Can't go wrong with Mario's or Lidi Bastinich's books -- they really know their stuff!" 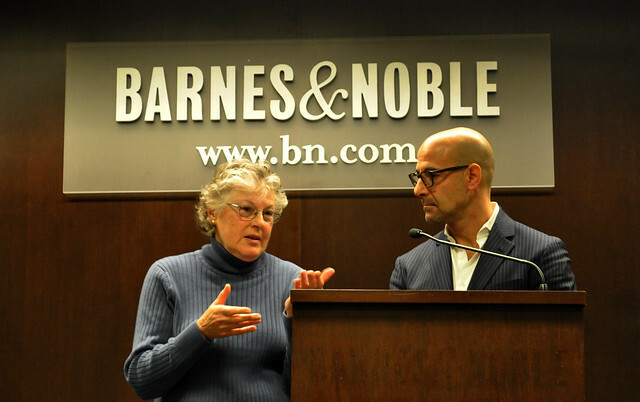 Mr. Tucci: "Nigel Slater, too." Mr. Tucci: "I'm sorry to say that I'm not a dessert person, but I do love peaches and wine." Do you a kind of person who sticks to the recipe or one that improvises? Mr. Tucci: "Can't you tell by my performance tonight? I am a total scientist." Aren't they the cutest mother-son pair? Adorable! 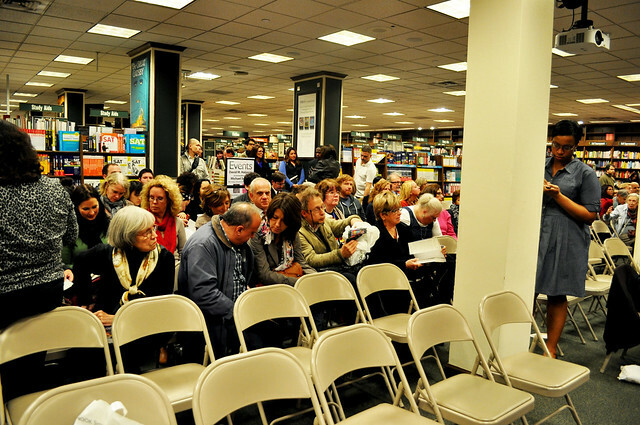 The crowd waiting for Mr. Tucci, his mother, and his father to sign cookbooks! 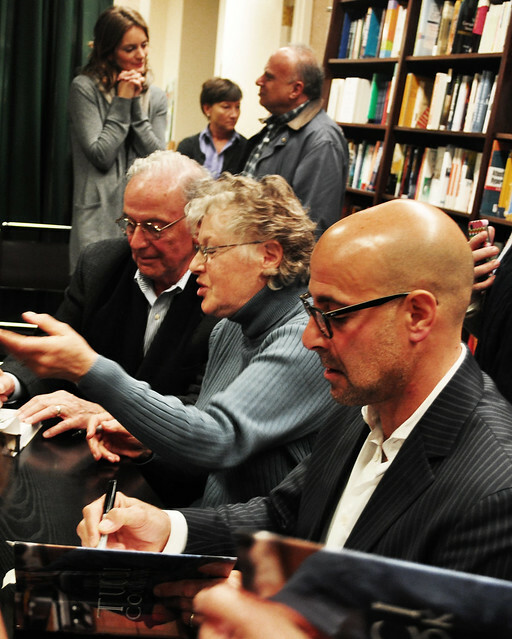 Mr. Tucci and family signing cookbooks (ooh look, there's Ms. Blunt in the background)! They were so friendly and fun to talk to -- no wonder Mr. Tucci has such a great personality. Definitely know where he gets it from now! 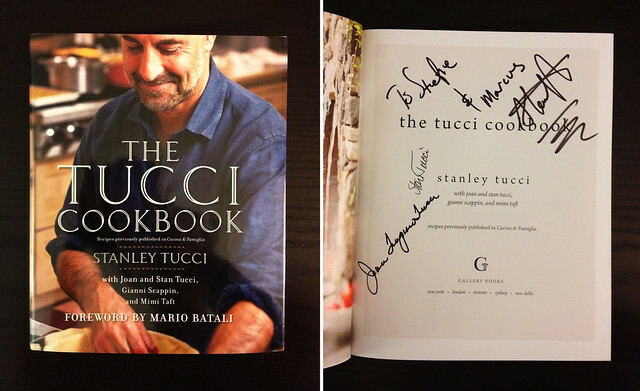 My copy of The Tucci Cookbook signed by Mr. Stanley Tucci (both senior and junior!) as well as Mrs. Joan (Tropiano) Tucci. 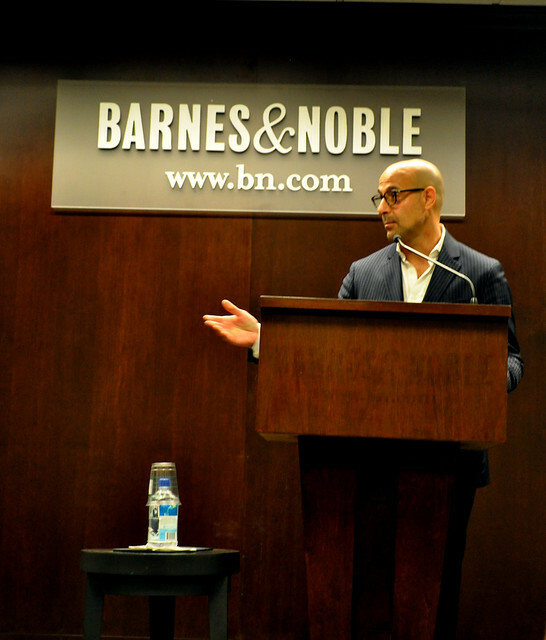 Findings: This could easily be one of the best book signing events I've attended, if only for the entertaining Q&A session driven by the hilarious answers delivered by Stanley Tucci. He was so much fun interacting with the audience, making it very casual and enjoyable to hear about his latest culinary endeavor. It was also refreshing to see what other things he has happening in his life along with his fabulous acting career (loved him in The Devil Wears Prada, Easy A, and The Terminal), especially such a fond appreciation for cooking and family roots. Seeing celebrities out of their element like this is so humbling and inspiring. Can't wait to read all about his family and delve into some of the recipes!